Loading up for the Christmas holidays, three new films to which the term "family" applies, to varying degrees, hit theaters. Charlotte's Web is a big-screen adaptation of the beloved E.B. White children's classic, about a simple pig named Wilbur, born the runt of the litter. Saved from the axe by the farmer's daugher Fern, he attempts to avoid the ultimate fate of a pig (i.e. Christmas dinner), with the help of a friendly spider and the rest of the farm. If it seems a bit similar to Babe, well, you're not wrong, except that Charlotte's Web was there first. Produced by Walden Media, the family-friendly operation that finally struck gold with the first film in the Narnia series last Christmas, the film has lined up an impressive group of voice actors to bring in the adults (since kids who've read this book or had it read to them are pre-sold), including Julia Roberts (for as much as she helped The Ant Bully this year), Cedric the Entertainer, Steve Buscemi, Robert Redford, Oprah Winfrey, and many more. 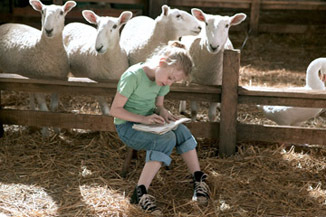 Future ruler of the world Dakota Fanning plays the farmer's daughter.